Speakers at January Meeting ' Raymond Pogue, Pogue Soil Solutions, Terence Fox, Group Chairman and Padraig Shevlin, Glenside. South Tyrone Ulster Farmers’ Union Group have been busy over the past months. The Group enjoyed a very successful family fun night and steak barbecue in September. Over 150 members and their family were treated to a bouncy castle, face painting, rodeo bull and live music at Dungannon Rugby Club. The steak barbecue was well received and members got a chance to speak to Deputy UFU President Victor Chestnutt. Robert McIlroy receiving a hamper from Terence Fox, South Tyrone UFU Group Chairman. Robert son William McIlroy and grandchildren Samuel and Eva McIlroy are also in the photo. 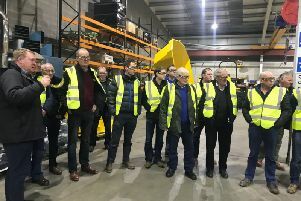 The winter programme started in October with David Wright, Northern Editor IFJ and Tony O’Neill, Chief Executive of the Agri Food Strategy Board, talking about the consequences of Brexit for the Northern Ireland farming industry. It was discussed that Northern Ireland faces greater challenges. In November the Group were hosted by Parklands Veterinary Group, Moy Road, Dungannon. Seamus O’ Kane, Ian Stewart and David Mulligan gave a very informative discussion on reducing the use of antibiotics in farm animals. At the December meeting, Mrs Kate Cairns engaged in a comprehensive discussion about agricultural vehicles on the road. There are ‘Agricultural Vehicles on the Road’ books available for members to collect in the office which outlines various issues such as age and weight restriction, limited use vehicles. Padraig Shevlin, Regional Manager with Glenside, was the guest speaker at the January meeting. He discussed the key elements required to have a healthy soil structure. He stated that for every one centimetre deeper your roots are, you access 30 tonnes more soil across a hectare of land. A cheque of £215 has been given to Northern Ireland Air Ambulance. This was the proceeds of donations given by members who received hospitality at the stand at Clogher Valley Show during the summer. Group Chairman Terence Fox and Senior Group Manager Denise Kelso handed out Christmas hampers in December to UFU Honorary members Robert McIlroy, Killyman, George Doupe, Dyan and Willie Irwin, Benburb. They also took the opportunity to visit Past UFU President, Walter Elliott. The good wishes of the group were given to them. The Group’s silage competition took place at the end of last year. Congratulations to William, David and Anne Simpson, Dungannon on being placed first in the dairy section. Second place went to Gary and Garnett Liggett, Dungannon. The beef section was won by Stephen Hayes, Clonmore with William McIlroy, Killyman taking second place. Many thanks to everyone that entered the competition. A certificate and a small voucher were given to the prize winners at our January meeting. Members are reminded that the next group meeting takes place on Monday, February 6, in Dungannon Rugby Club. The guest speakers will be Mrs Aileen Lawson, UFU Senior Policy Officer who will discuss Nitrates and the Water Frame Directive. If members have any queries or need to contact our technical officer, Hannah McCollum, please contact the office on 028 877 25973. There are still diaries and wall planners available in the office for members to collect.